This summer at the beach, I was standing at the water’s edge as a women was making her way in through the foaming waves breaking at the shore. I watched her struggle to get past the undertow. She lost her footing, regained it, only to lose it again, falling forward. She struggled to right herself just as another wave hit, pushing her backwards this time. She finally managed to plant her feet, and she saw me watching her, and she laughed. “Please don’t make me have to save you,” I said. I admire heroes. It must be wonderful to be in the exact right place to make a difference in an emergency – to change someone’s life – maybe save someone’s life. I can respond adequately in a pressure situation. And I think I would do the right thing if confronted with a true crisis. But the truth is, I really would rather not. I’m not the hero type. Donating an organ. If I could help another person get healthy without losing any of my body parts, I think that would be better. Shaving my head in support of a friend with cancer. I have a friend who went through chemotherapy. One night over dinner, I confessed that I was shallow enough to think that losing my hair is as terrifying as cancer itself. And my friend agreed. She called it the final insult to her sick body. Testifying at a trial. I once sat on a malpractice jury. I hated making a decision that was bound to hurt one person or the other. I saw the “losing” party in the parking lot after the trial. I wanted to give him all the money in my wallet. Picking up relatives at the airport in a snowstorm. This is no biggie, right? But please – if the weather is horrible, just stay at the airport hotel until it clears up, okay? Taking in strangers after a natural disaster. Hurricanes and tornadoes and blizzards can destroy someone’s home. The people who are lucky enough to be spared should share their homes with the tragically unlucky. And I have shared mine – with my mother. Saying a few words at a funeral. I care. I hurt. Most times though, I can’t share it. I could probably write a wonderful eulogy. Maybe someone else could deliver it. Retrieving a severed finger and packing it in ice to take to the hospital. We have a friend whose eleven-year-old daughter had to do that when her Dad cut off his thumb with his jigsaw. I can picture my husband cutting off his thumb. I can’t picture myself picking it up. Passing messages to political prisoners. I’ve marched against two wars. But that was as a part of a large group. I don’t believe I can be brave alone. I would drop the message in front of a guard with a gun. For sure. Delivering a baby… I don’t even like the responsibility of doing someones’ taxes. I can’t even express how much I don’t want the responsibility for a human being coming out of you. Talking someone off a ledge. 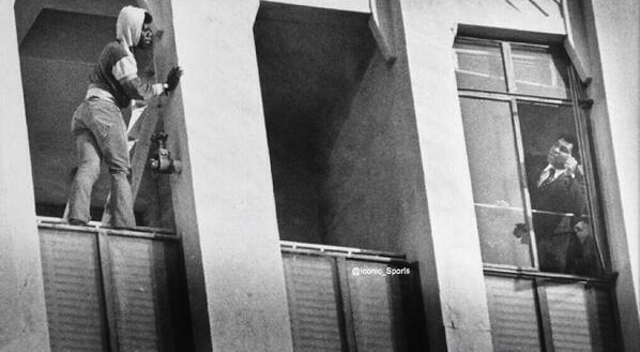 Muhammad Ali did that in 1981. Wow. Can you imagine? How do you know what to say? I could get it all wrong and the person could think “Now I REALLY don’t want to live.” That suicidal person may have had the worst possible life. I do not wish to be the final straw. I’ll do the thumb thing and the airport snowstorm, the rest will just have to suffer like the rest of us. I can’t drive in bad weather. I would rather pick up a severed thumb. I can relate (and agree with) to most of what you wrote. However, someone who is as well-known (and with as big an ego) as Ali may be able to go “beyond the call” to help another, and so perhaps could you, if you ever get as admired as he (!). So, hang in there; someday you could be famous! If I get to be really famous, I will try to save someone. I think I would actually come through in an emergency. I would do it. But I hope I won’t have to. I’m with you. I hope I would do the right thing in all of your listed scenarios…but I don’t want to find out. I agree wholeheartedly. Didn’t know that about Muhammed Ali — I’m guessing his celebrity status probably helped with that situation. Many times, I’ve been at a funeral when the officiant has asked anyone who would like to say a few words or share a memory. And many times, I’ve had special memories of the deceased, but there’s no way I’m going to stand up in front of a room full of people to say anything. I saw that story recently about Muhammad Ali and was impressed. I also saw an interview once where he imagined that every nice thing you do gets written on a piece of paper that God saves, and he wanted to have lots of those little papers when he died. It was a wonderful image. And I’m sure I could have saved that lady at the beach. I could have pulled her in the two steps to safety – I think. What a nice thought about God saving pieces of paper about our good deeds. I’m going to remember that. Thanks! When confronted with an emergency, I think most of us can pull it together to help (except maybe for the organ thing — that’s a big deal). We turn off the normal brain and work on superpowers. Afterward I’d barf and need a lot of chocolate or alcohol. I think you are exactly right. My husband is over-the-top squeamish and panicky over all things medical, but when it looked like I was having a heart attack, he was calm and efficient, and did what he needed to do. (He collapsed later.) And BTW, not a heart attack, but a gall bladder attack – and my gall bladder and I were divorced 2 months later. Hope the divorce wasn’t expensive. I lot a lot of stuff I loved in my last one. I’m a great person to have around in an emergency, mostly because I so rarely think before I act. Or speak. But if someone is drowning, I would not go in after them because I am the worst swimmer in the world. Of course then I could make people die laughing, but I don’t think I’d get hero status for that. I’m not a great swimmer either, but she was in up to her shins. I might have been able to handle it. But then again, I may have tipped her over. I will be the one who calls 911, and gets the professionals to you as quickly as possible. I think that’s a really good plan. I’m going to adopt that plan.